Leadership has been a buzz word in pop culture for the past 25 years. It is the undefinable ever evolving sometimes unreachable goal of CEO’s and yuppies alike. People present leadership as the cure-all for what ailes our communities, campuses, and offices. But there is a dark side to leadership, the side that no one talks about. EVER!! until now!! It is the thing that we don’t think about until we are knee-deep in our roles. Then it hits us!! The dark side of leadership. Don’t be scared of the dark side of leadership, embrace it! The force is strong in you!! Make the most of your decisions and role as a leader, make the opportunity cost worth it. 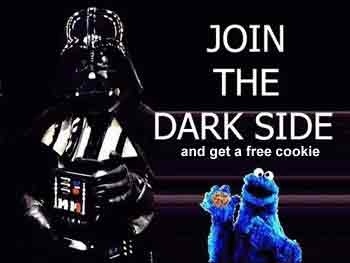 “….and sometimes the cookie is stale.” Good blog, no one ever discusses the “dark-side” of leadership (until now)- I think thats why so many who call themselves leaders, really fail to do so. Leadership costs- and the price is high. Good One Sir. Very true! People normally aren’t aware that when you are a leader it’s a 24/7 job. You don’t get vacation, sick, or time clock. You’ve signed yourself to be there for others. If you’re a real leader it’s not a problem normally, it when you’re not it becomes a problem. I like this article because it makes menfeel good about the choices I make as leader. I never thought about “the dark side” but I’ve definitely experienced it unknowingly! Lol! !